I'm having a long day with too much on my plate. I was just about to go to bed without posting anything when I decided to look up what the Writings have to say about sleep. "Regarding your question: There are very few people who can get along without eight hours sleep. If you are not one of those, you should protect your health by sleeping enough. The Guardian himself finds that it impairs his working capacity if he does not try and get a minimum of seven or eight hours." I think it's time to take the Guardian's advice. This afternoon I was lying down and the baby started moving. Every so often it goes on this wild rampage around my uterus and I can't help but wonder, "What is it doing in there?" I don't mean what is it doing physically. Obviously there's an assortment of kicking, punching and squirming going on. What I really wonder is what does it think it's doing? When it just moves a bit I assume it needed to shift to get comfortable, but when there's a long string of rapid thumps that move across the inside of my belly, then back again, then a big lump slides down the side, then there's a swift jab to my bladder, I can't help but think that it's up to something. Like it's got a plan. I never really thought the Baha'i concept of death would be on my mind so much while waiting to give birth. But the comparison to birth, the one that we use to describe what it's like for a soul to die, keeps flipping back and forth in my mind when it comes to my baby. It has expanded beyond an analogy for what it's like to change forms of existence. Now it keeps me thinking about what it's like to be alive. For example, if we are developing spiritual attributes in this life with no concept of what they'll be used for in the next, what does the baby think of the physical attributes it's developing right now? Is it wiggling around thinking it's got this hand and foot thing figured out, like we sometimes think we understand love or compassion? If so, what does it think hands and feet are for? And when we think we're being spiritually awesome, is there anyone in the realm of the spirit shaking their head and wondering what we think we're up to? What does the baby think the umbilical cord is for if it has no concept of nutrition or oxygen? Is our understanding of prayer just as limited? What does it think the placenta is? What does it think sound is? When it swallows amniotic fluid what does it think it's doing if it doesn't know it will someday have to drink? When it goes on a big kicking spree does it think it's doing important work, like when we do a bunch of overtime at our jobs? It's hard to comprehend that the baby doesn't know who I am. For now I am not understandable as another person, only as a habitat. What does the baby think the habitat is doing when I poke my belly in response to some kicks? Do we get spiritual pokes and not know what they are? Finally, I have to ask the really big question. Why, exactly, does the baby think it's so important to punch me in the bladder? 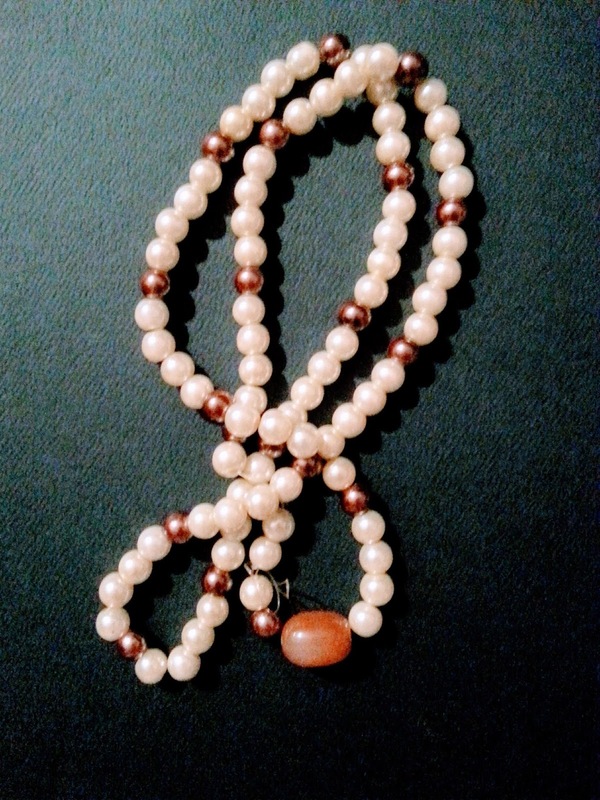 A few days ago I mentioned some benefits to saying the long obligatory prayer while pregnant. The only thing is, as your belly gets bigger and bigger the movements that go with the prayer get more and more challenging. Today I'm going to offer some tips on how to work with a changing body to keep this prayer a viable option for childbearing women. The first, and most challenging, pose we encounter is when the instructions with the prayer say, "Let him then kneel, and bowing his forehead to the ground..." Normally when people do this their knees are together and they just kind of fold forward till their head touches the ground. This is what I look like doing it at the beginning of the third trimester. Technically I can still pull it off but it has taken a slight modification. Normally my hips would be lower down, either on my heels or just above them. To accommodate my belly in this photo I've had to lift my hips higher and leave more space between my knees and my chest. While it kind of works, it's still pretty uncomfortable. ... try leaving a gap of a few inches. 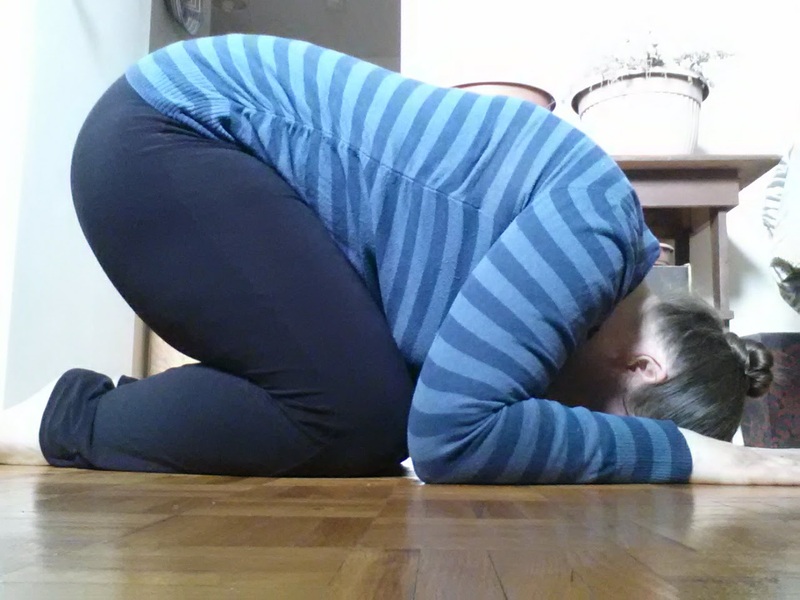 Leaving a gap between the knees leaves room for the belly to fit when you lower your head to the floor. As an added bonus, this modification also allows for the lower back muscles to be stretched out. Two portions of this prayer are to be said in a seated position. Since both occur right after a section said in the forward kneeling position described above, I have a tendency to just sit up again and sit on my heels. So far this still works for me. However, lots of other women have more trouble than I do when it comes to swollen feet and joint pain. Since we aren't given specific instructions on how to sit (the notes with the prayer just say that the one saying the prayer should "seat himself"), this might be another spot for a modification. If sitting on your feet is causing pain or discomfort you might want to consider switching to sitting cross-legged for the time being. This prayer requires a lot of getting up and down. In pregnancy our centre of gravity changes, and we often feel less steady, so we need to be careful to move in a way that provides stability. Here are some options to help keep your balance when rising back into a standing position after being on the floor . Step 1: Shift your weight onto one hip and bring your feet to one side. 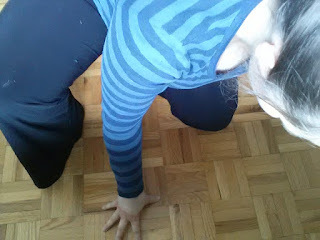 Step 3: Put your weight on the other foot and move into a standing position. One area of caution with this prayer is changes to blood pressure that can occur when moving from position to position. Sudden changes can cause severe dizziness, even if you were fine doing the same thing the day before. You can reduce the severity by moving slowly when changing position and taking a few deep breaths before going onto the next section of the prayer. You might also want to consider staying close to a chair, bed, or other piece of furniture that you can hold onto for support while getting up and down. If that doesn't work consider switching to the short obligatory prayer for a while. While some dizziness and light-headedness is normal, it should go away after sitting in an upright position for a few minutes. If it lasts for a prolonged period of time and is accompanied by sudden swelling, visual disturbances, headache, or difficulty breathing, and those symptoms also do not go away after returning to an upright position, consider contacting your health care provider. That combination of symptoms can be a sign of preeclampsia, a medical condition that is unrelated to saying the prayer. If this happens to you, it is likely that these symptoms were starting anyway and that you just happened to be paying more attention to them while praying. Tonight I'm showing you my prayer beads. They were made by a junior youth in a JY group I was animating about six years ago. I'm still in touch with some of the members of that group. It's been a treat to watch them grow up and was a bit of a shock to realize they were heading to university this year. While handling the beads tonight I was think back on the time we spent together in that group. At the time it felt like a great deal of work to keep everything going week after week, but now it seems like the time I spent with them was far too short. It suddenly feels very tangible to realize what a fleeting yet crucial time the period of junior youth really is. Yesterday I was reading some of the other posts from the Baha'i Blogging Challenge and came across one on Doberman Pizza. It was reminiscing about the early days of Baha'i blogging and, I've got to say, it really brought back some memories. Blogs were really just becoming a thing around the time my friends started going abroad for years of service. Prior to that people would communicate by sending a big group email to recount their latest adventures. Then, after receiving it, you'd probably get it sent to you a second time because their parents would spam send it to make sure everyone they knew was up to date. Then one day someone's mom sent us all a link. It was for some kind of website called a blog where our friend was posting updates about her year of service activities. I was fascinated. Pretty soon I found out the internet was full of blogs. Sure a lot of them were mostly pictures of people's cats, but I thought it was a brilliant concept for globetrotting Baha'is. When it came time to head off for service myself, gosh darn it, I was going to have a blog! Like many before me I turned out to be terrible at maintaining it. This was mostly due to the fact that the house I was living in didn't have internet and the library only allowed 30 minutes of computer usage per day. Still, I did what I could and the people back home seemed to appreciate it. Things sort of chugged along with a combination of blogging and email that year. Then about a month before I was supposed to leave I was having dinner with a couple of former housemates. One of them was an exchange student from China who was also getting ready to head home and we all wanted to get together before we ended up in different countries. After a while the conversation turned towards keeping in touch. "Do you have Facebook?" my Chinese friend asked. "What?" I didn't know what she was talking about. "The Facebook." She assumed I was having trouble understanding her accent. "Face," she said pointing at her own face. "Book," she said while miming a book with her hands. "Yeah," I said. "That's what I thought you said. But what is it?" "You don't know Facebook?" She sounded shocked. "Everybody is using it. You make and account and go on." "Yeah, but what is it?" Later that night she sat me down at the computer and signed me up for an account. (The house had gotten internet right around the time I moved out.) I wasn't quite sure what I was looking at but was surprised to find a bunch of friends from back home were already there. Over the next few weeks more and more joined up and pretty soon I was invaded with friend requests from people I hadn't talked to in ages. In some cases I was surprised they still remembered me. Over night I was thrown into the world of social media and microblogging. The fact that this came just as my year of service was winding down had a profound effect. I had felt like I was doing well to be serving at a time when blogging and email could easily keep me in touch with those I was close to back home. Then all of a sudden that was all left in the dust. Not only could I update people on what I was doing but I could see what everyone else was doing too. And it was kind of like all of us, all at once, in one place. And it took very little effort. There had been some lonely times while I was away but connecting with everyone from different parts of my life all at once suddenly made me realize what an illusion that had been. It also meant returning to Canada didn't feel like the end of the friendships I had made in Denmark. Oddly enough the one person I wasn't able to keep in touch with through Facebook was the one who introduced me to it in the first place. Because, well, she went back to China. As we now know, Facebook and China didn't exactly become BFFs. The whole blogging thing was never quite the same once social media came along, but the Baha'i Blogging Challenge has been a great reminder that it's not dead. It's sparked a little nostalgia but also fostered some thoughtful new content that wouldn't have happened otherwise. Some blogs that were old favorites are getting more fired up than they have been for a while and I'm getting to check out others that I never would have known about otherwise. Let's see what the rest of the month brings. While making efforts to integrate the Long Obligatory Prayer into my day recently, I've notices a few benefits to saying it specifically while pregnant. 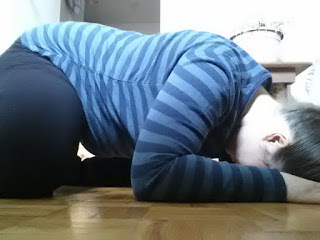 It helps with optimal fetal positioning - One of the unique aspects of the Long Obligatory Prayer is how it integrates movement along with the words. The Medium Obligatory Prayer also does some of this but not nearly to the same extent. The benefit to pregnant women is that most of these movements involve bending forward and kneeling on the ground. Because many of us live in an environment that is becoming more materially comfortable we are spending more and more of our day sitting and reclining, which is quite different than what our ancestors did through most of human history. Women used to spend a lot of time in activities - scrubbing floors, tending fires, weeding gardens - that worked with gravity to get unborn babies into ideal positions for birth. The kinds of movement that go with this prayer are the kinds of movements that many of us are missing in our daily lives and allow for gravity to help the baby into a more optimal position. If your baby is breach or posterior this alone is probably not enough to get it to turn, but would be very complimentary to programs like Spinning Babies or Dancing For Birth. It's good for your back - I've found that the same movements that help with fetal positioning can also help relieve the lower back strain that comes with later pregnancy. Prostrating on the floor brings me so much relief that it's tempting to draw out those sections of the prayer just to linger there a bit longer. It can be said anytime of day (good if you're getting forgetful) - I don't know about anyone else, but I have never been as forgetful as I have been since I got pregnant. I didn't even know it was possible. I'd heard of pregnancy brain but always thought it was over-hyped. I was wrong. When you're losing track of time, going with the prayer that doesn't need to be said at a specific time of day can be a real bonus. You might not have the chance after the baby arrives - The first weeks with a new baby can be demanding. Depending on individual circumstances, prayer might become something that is more likely to happen in short bursts in between other things. Many parenting websites advocate some kind of pampering with pedicures and spa treatments before the birth, but why not give your spirit some extra care while you have the chance?